Takeaway: To determine the factors behind salt-induced corrosion under coatings, both the physical and chemical aspects of delamination must be considered. Hap Peters is affiliated with CHLOR-RID International, Inc. and can be contacted using the options on the right. For info on how we work with industry partners click here. Due to the complexity of the mechanisms of salt-induced corrosion under coatings, much of which is still theory, there are many interpretations and assumptions made to get to a desired conclusion. Oversimplification may very well be leading to confusion and misunderstanding of the subject. All coatings are defined as semipermeable membranes and have varying vapor transmission rates. Water in the form of vapor moves freely from one side of the coating to the substrate under the coating and back out until pressure is equalized. If salts are present on the substrate, salts absorb that moisture because they are hygroscopic (they are more stable in the hydrated form) and a salt solution is formed. The solution formed cannot pass back through the coating from the substrate. What exists then is a differential in concentration, with a higher concentration solution on the substrate under the coating. As more vapor penetrates the coatings to dilute the formed salt solution on the substrate, the concentration is reduced. In summary, the first step of the entire salt-induced corrosion cycle is water uptake. Learn more about soluble salts in Soluble Salts and Coating Performance. Physical coating adhesion is compromised as a result of the distending of the coating where the salt solution has formed and builds up. Yet there is an equally important set of chemical dynamics that come into play because the presence of the salt solution results in all the ingredients necessary for salt-induced corrosion: moisture, oxygen and the electrolyte. Moisture in the presence of the salt anion allows water to polarize (conceptually separating into H+ and OH-), facilitating the hydration (dissolution) of the metal to form iron chloride (defined as an acid salt). A conductive pathway is generated as the anionic species begins to react with the steel in the presence of the trapped moisture under the coating. To summarize, the presence of the anion salt species favors the hydration (dissolution) of the metal and increases the ease with which the metal ions enter into solution (dissolves the metal). Also known as cathodic delamination, blistering occurs at the cathodic contact points, not at the defect (anionic pitting area). The alkaline environment destroys or weakens the adhesion of the film producing the osmotically active products at the metal/coating interface mentioned in #3. Epoxies, for example, are incompatible with alkaline substrates because the alkalinity interferes with the cross-linking functionality of polymeric substances (nor does it allow polymeric epoxies to cure properly). 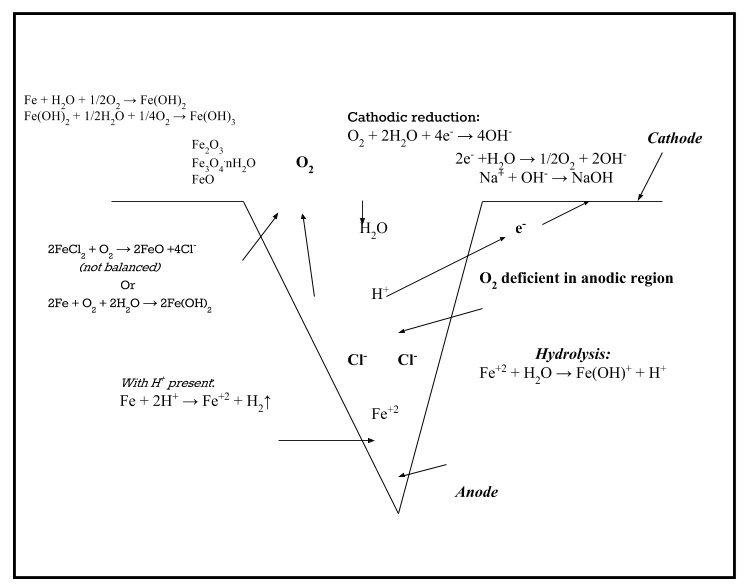 The anodic region, where the metal is being dissolved in a very acidic microenvironment, is of great concern because it is the place that can lead to structural weakening and loss, and ultimately result in potential catastrophic failures. The tendency is to deal with only the physical aspects of delamination, because it is much easier to explain. The chemical aspects are just as important, so the type of anionic species is relevant because of its corrosivity. The more aggressive an anionic species, the more critical the impact of the chemical interchanges between the coating and the substrate. Knowing what anionic species is present and its concentration (amount) is important and directly related to the outcome of the coating performance.